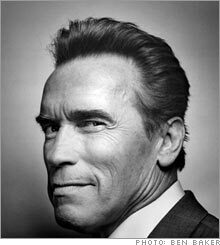 When Arnold Schwarzenegger was elected governor in 2003, the environment was not high on his agenda. Now it is. That matters, because where California goes, the rest of the country just may follow. Fortune's Nina Easton reports. (Fortune Magazine) -- Arnold Schwarzenegger's private office is in a commercial building in Santa Monica, and it bulges with manly-man props from the movies. It's a long way, then - in every way - from Theodore Roosevelt's rambling Long Island, N.Y., home, which is crowded with stuffed animal heads and books. But the statues by Frederic Remington on display hint at a spiritual kinship with T.R., who also appreciated the artist's dynamic bronzes of Western life (though he might have been bemused by the Andy Warhol hanging above Schwarzenegger's desk). The California governor looks to Roosevelt, the great Republican conservationist, as inspiration for his mission to make his state, and the GOP, leaders on the environment. Last fall, Schwarzenegger signed a bill into law to cut the state's greenhouse-gas emissions 25 percent by 2020 and followed with an executive order requiring a dramatic drop in the carbon content of transportation fuels. He has vowed to fight attempts to reopen the California coast to offshore drilling. This record was central to a political comeback that culminated last November in a reelection victory with 56 percent of the vote. At home, he has retooled one of his famed Hummers to run on hydrogen and another to use biofuel, and he's installing solar panels to heat the family residence. How did you get to this point on the environment? We now know that what we've done in the past 100 years has caused such unbelievable damage to the world. We didn't know better, but now we do, and now it's not okay. There are certain things we know will happen in the next 30 to 40 years if we don't roll it back. So we have to start doing it now. Every marathon starts with a first step. I know the American mentality when it comes to finances is to look at the quarterly returns. But there are decisions you will make today, right now, that will take you in a different direction if you think ahead. I have to think, How is California, with its population growth, going to get its energy supply in 50 years? Does the GOP get this? No. There are people in both parties who don't get it, but I would say I have a tougher time selling those things to the Republicans. Those people look at this in a narrow way rather than really studying the subject and recognizing that this actually gives us an opportunity to create a whole new industry of clean cars and clean engines and components to build those engines. In California, what we call clean-tech industries are exploding left and right. Won't there be losers with stricter pollution standards? Only as much as the auto industry or any industry has to make changes to adapt to the behavior of customers. You have to react quickly. Even if we don't do anything about it, the Japanese will, the Chinese will, the Germans will. Detroit is struggling with it, yes, because they are behind. Cement factories said there is no way to produce cement without polluting the way we do now. We found that there are many European companies producing cement that release only half the greenhouse gas, so there is the technology there. They are already using it in Texas. When we passed our $20 billion infrastructure bonds, we said, Let's not build any of those roads without that technology. We let the cement companies know this: Adopt that technology, and we'll sign contracts with you. We don't want you to suffer; we want you to make money. I'm a businessperson who sympathizes with both the economy and the environment. So we say by 2012, we start making changes. We're giving an immense amount of time. What should be the balance between government-driven vs. market-based solutions? Market-based solutions alone won't work. It is up to us [in government] to say, Here are the laws: You have to inspect the milk so it's clean. You have to inspect the meat. If you screw up with the spinach, we have to take action to make sure people don't get sick. I never think of industry as being villains. I'm not for you getting taxed, if you're an oil company, just to punish you. But we [the government] have to guide you and say, This is the new direction we are going to go. Do you see alarmism in the discussion of global warming? Let's assume for a second that global warming is 10 percent less of a problem. No matter what percentage you take off, we are in big trouble. That's the reality. We've seen the photographs of glaciers melting. We know that is a phenomenon that is happening. We know that the water is rising. We know that we are polluting the world. All of this is reality. I'm not an environmental fanatic. That's why our program [in California] works, because people know that I have not come from that background. As governor, you talk to scientists at universities. These are not wacky people, but they will tell you straight. Then you see the reports of 3,000 scientists, then you read reports of the UN. There is no conspiracy, this is real stuff. I'm an optimist. I don't look at this as if the world is coming to an end. I see it as a great opportunity to clean up our mess. We're grownups, we aren't children, and we can do it. That's why we like to be out front in California. That's power. Theodore Roosevelt set aside national parklands, and Richard Nixon created the EPA, but the Republican Party has not recently been associated with assertive environmental policy. That could change. Former governor George Pataki made New York part of a regional compact of seven Northeastern states to reduce greenhouse-gas emissions. Newly installed Florida Governor Charlie Crist has put renewable-energy production atop his agenda. And South Carolina Governor Mark Sanford calls himself a "conservative conservationist." Sanford concluded that humans were contributing to global warming after visiting scientists in Antarctica and later watching pine trees on his family's coastal farm die from rising salt water. Sanford is more skeptical than Schwarzenegger, though, about the role of regulation, saying, "I'm a government-as-last-resort kind of guy." Inside the Beltway, Indiana Senator Richard Lugar is pushing alternative-fuel legislation, and two powerful former farm-state Senators - Republican Bob Dole and Democrat Tom Daschle - are lobbying Congress to make ethanol and other alternative fuels part of the 2007 farm bill, although this surely has as much to do with agricultural politics as clean energy. And Arizona Senator John McCain has long supported measures to reduce global warming.